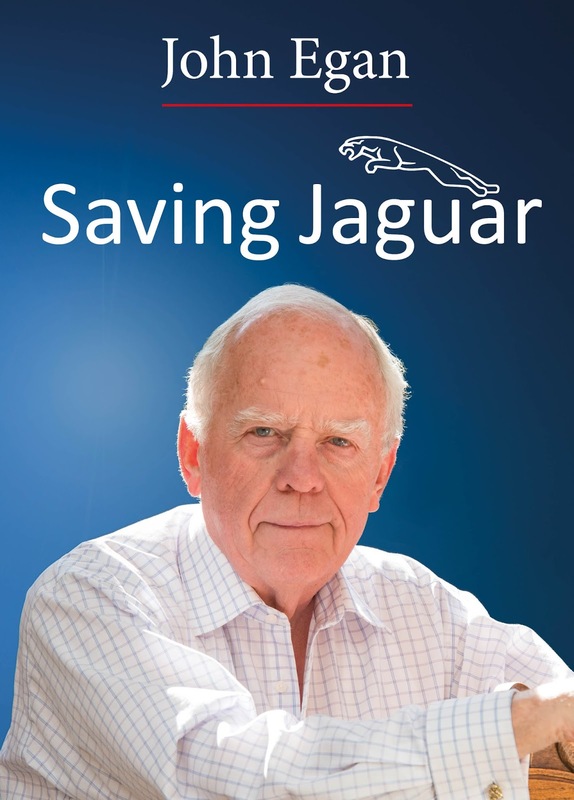 As Jaguar scales new heights in terms of production, output, quality and technical expertise, a new book depicts how Sir John Egan ‘saved’ the company from extinction and put it on a new footing. He even rescued the name 'Jaguar'. Egan’s account of events at Jaguar in the 1980s has to be seen against the backdrop of the times: a depressing picture of an industry in the hands of impotent management, powerful and dictatorial trades unions, poor products, and even worse quality and reliability. This riveting book, by a hugely respected and successful man – the ‘darling of the Press’ – is incisive, giving commanding insight into behind-the-scenes happenings at the luxury car maker, both in his tussles with the unions and his struggles to lift quality and prepare the company for the future; a future that might one day involve him and others buying out the company or, at the very least, arranging a deal with one of the “titans of the industry”, namely BMW. Saving Jaguar is at the same time understandably depressing for the picture it paints of the UK motor industry in the 1970s and 1980s – see also The slow death of British industry by Nicholas Comfort; one that is unrecognizable today thanks to input from Japan, Germany and India; input that since has allowed Britain’s engineering and management talent to bubble to the surface once more. A precursor to Egan’s account of events at Jaguar is the image of a ‘good’ knight in shining armour riding into town to rescue a damsel in distress. Another ‘bad’ knight had ridden into the same town some years previously, namely Geoffrey Robinson. Robinson not only failed miserably on his brief to turn the company round but surrounded it with alleged bribery and corruption scandals associated with a dubious paint shop contract, preceded by mysterious financial happenings with the British Leyland Mini at Innocenti in Milan that refused to go away. BL had purchased Innocenti in 1972 for £3 million and Stokes put Robinson at the helm, with disastrous results. The company was sold in 1976. Egan gives the gregarious Robinson little exposure in his book which, as it unfolds the history of the UK’s “outrageously chaotic” automotive industry of the period, risks opening several cans of worms. Egan is not afraid to confront these head on, explaining in detail his techniques in the role of ‘turnaround man’. Robinson and Egan had three aspects in common; both were in their mid-thirties when they were appointed to put Jaguar on its feet – Robinson in 1973 and Egan in 1980. And both were ambitious and astute. But there any commonality ended. Politically they were poles apart – and this made the difference between success and failure. Egan, a Conservative, could not be more different from the Labour-supporting Robinson who much favoured co-operatives, even to the point of trying to ‘save’ the Triumph Motorcycle co-operative in Meriden. Robinson, as a socialist, presumably nothing wrong in running a company making cars for the rich. After studying petroleum engineering at Imperial College, London, John Egan took up employment at Shell in the Middle East before joining AC Delco, a parts company within General Motors. Aged 32, he joined British Leyland (BL) in 1971 as part of Central Staff which had the overall remit to make BL an efficient and profitable car company. Egan’s boss at the time, was Geoffrey Robinson (educated at Cambridge and Yale universities) who, being several months younger, had joined BL a year earlier (1970) from the Labour government’s Industrial Reorganisation Corporation (IRC). Egan admits his “route to stardom” owed much to a great deal of luck. Having made progress in Central Staff, Lord Stokes offered him the job of managing director (md) of Leyland South Africa. Egan turned that down but was then offered the job of “spearheading the creation of the Specialist Car Division” (SCD) with the view of integrating parts supply for Jaguar, Rover and Triumph. Successfully completing amalgamation of SCD’s parts operation, Egan turned his focus to extending the Unipart operation beyond that of merely Austin and Morris. A “petty internal squabble” bubbled over who should run the business – Egan won and turned Unipart into a uniquely successful company-wide operation making £70 million “supplying the service parts and parts that fell off.” The irony was that as Egan managed Unipart successfully, the rest of the BL business was in “dire straits”. Job done, Egan became parts and service director of BL Cars but at this point realised that “to have any future in BL he would have to run a core product company like BL Trucks”. Alex Park, then running the operation did not agree and at that point Egan felt BL had “no future under its then leader” and with that he left the company to spend four years at Massey Ferguson in Canada. This overseas experience added another valuable dimension to Egan’s career at which point Michael Edwardes, then in charge of BL, “was looking for people who had been successful in the fierce cauldron that had been BLMC”. Edwardes first offered Egan the task of running Jaguar Rover Triumph (JRT), previously the Specialist Car Division. Egan turned this down “believing his leadership process would be too diluted across too wide a business”. Also, he considered Triumph “beyond hope”. However, a later offer from Edwardes to run Jaguar “was altogether more compelling”. He and Edwardes “agreed a deal” on Jaguar which was then losing money heavily and, without rapid improvements, would have to be closed down. “But if we could turn it around, he (Edwardes) accepted it should not remain within BL Cars. Jaguar would have to be independent , but would have to earn whatever independence it got – that was the only way I thought I could control the (trades) unions,” declares Egan. Egan makes clear his business modus operandi. “I managed by creating teams of strong-minded individuals on whose advice I could rely” he writes. Egan’s tenure at Jaguar from 1980 has to be viewed against the then industry background. The Labour government of the day set up the IRC in 1966 with a remit to promote “efficiency and competitiveness” in British industry. This led to the National Enterprise Board NEB) under the leadership of Lord Ryder, who later resigned. As part of the Labour government’s reorganisation of the UK motor industry it formed British Leyland Motor Corporation (BLMC) from the merger of British Motor Holdings (BMH) and Leyland Motors Corporation. It made Lord Stokes as chairman. In 1973, Stokes appointed 35-years old Geoffrey Robinson as managing director of Jaguar. Robinson, with his enthusiastic endorsement of socialism, arrived fresh from running Innocenti in Milan Italy. Smooth-talking Robinson won the Jaguar job having convinced Stokes of Innocenti’s profitability and its record return on capital under his reign. But behind the façade lay hidden high costs and a communist trades union tightening its grip. On joining Jaguar, Robinson was told that Jaguar’s quality was “no good” and that he should “improve it”. Consequently, Robinson set about trying to rival BMW and Mercedes-Benz. With Jaguar’s order book standing at 30 months Robinson saw a golden opportunity to double production to 60,000 units a year. Robinson became well known for his maverick behaviour, not the least as the architect of what became the famous Jaguar paint shop scandal in which a contract worth millions seemingly had received no senior manage approval. Robinson’s expansionist plans to boost production required the new paint shop to silence criticism of poor paint work from dealers and customers. At this point, Robinson mysteriously renewed his links with Italy and ordered a new paint plant from Interlak – the infamous Project 2641 – even though several companies in Britain could supply a similar plant. Robinson appointed manufacturing Robert Lindsay as his intermediary on Project 2641 with Interlak. Before long rumours were flying round the industry of allegations of bribery and corruption, especially as the contract price spiralled from £8,650,000 to £15,644,000. At that point Stokes took charge and put the issue of a new paint shop on the back burner. In May 1975, Robinson ‘resigned’. In 1977, the UK government appointed South African Michael Edwardes as chairman of British Leyland; he was knighted two years later. Edwards’ tenure lasted until 1982. All of Robinson’s maverick style had become water under the bridge by the time John Egan arrived in 1980, but the paint shop remained a cause for alarm and required Egan’s attention as he embarked to put quality on a new footing. And so it was in April 1980 that Egan started work at Jaguar faced by striking union workers outside the gate. In meetings he told them “I am here to recreate Jaguar”. His first conclusion proved to be that Jaguar had no future unless it could fix the outmoded Castle Bromwich body and paint shop, the result of “a British government inept at investing in business” and the “brutal enemy” – the trades unions. Throughout his book, Egan tells it as it happened without pulling punches. At the outset he reaffirmed that “business is about making money out of satisfying the customer” and managers “had to control the company, not the unions”. Even from the beginning, Egan was assured and confident: “I know I am capable of saving Jaguar”, he said. Jaguar could sink no lower. In 1980 it lost £50 million on sales of £150 million. That’s how bad things were. Meanwhile, predictably, Robinson became Labour Member of Parliament for Coventry North. And so began Egan's transformation starting first with direct action on quality, including taking firm against suppliers like Joseph Lucas and GKN. Bosch refused to help on the basis that “Jaguar will not live long enough”. Lucas’s business model relied on making small profits on original equipment business but “huge profits” on aftermarket products. Egan (who once was told that Lucas was the only lighting company that informed its customers to be home by dark!) found himself kick-starting Lucas’s revival as well as Jaguar’s as he embarked on winning supplier support. He used the Royal Shakespeare Company to teach his managers to lead meetings. He sought help from BMW – “learning from grown-ups has always been the most efficient way to learn”. Gradually the company began to make progress, so much so that £100 million was forthcoming from Industry Secretary Norman Tebbit for the new model programme – no wonder Lord Tebbit’s photograph appears twice in the book! The £100 million was not a passport to the sunny uplands; the business plan behind it called for breakeven in 1981 and profitability by 1982. If not Jaguar would close. During 1981 Egan became “battle weary” trying to “motivate the workforce to believe in their own capabilities”. He found also “bureaucracy the most discouraging of all human barriers”. Eventually, Egan got on his bike to tour major regions around the world selling cars to dealers in order to meet the forecast he had drawn up. Before long he had his North American dealers on side - they had faith he could deliver cars they could sell. But to increase production and generate profits required the workforce to produce four cars per man against three previously. To increase production Egan had to fight a “wily enemy”. It was a battle of “wills and skills”. “The shop stewards had an easy life looking for trouble but doing no work themselves,” he writes. To circumnavigate this he appealed to the workforce and their wives directly – staging “hearts and minds” evening events to drive home the productivity message. It was also the start of computer-assisted learning to boost employee knowledge. He also secured greater interaction with colleges – hence the first part-time MBA course at Warwick Business School. The result of the combined effort witnessed a fall in the hours per car from 700 in 1980 300 in 1984. Process improvement followed process improvement. 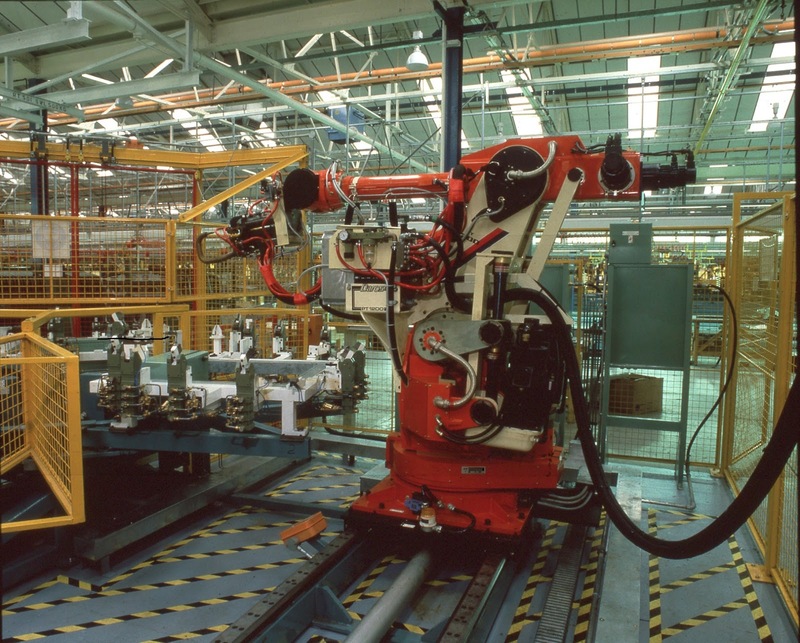 TQM was introduced and industrial robots arrived for the first time. 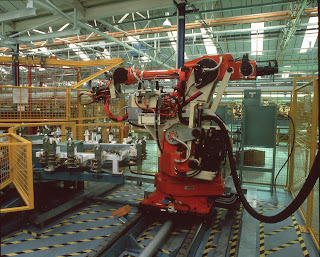 Robots, like this welding robot of the 1990s shown below, brought increased productivity and quality. Egan never rested. He was always looking for solutions to problems, even to the point that if Edwardes’ recovery plan for BL had failed, Egan and others would buy Jaguar out. He was not going to let BL’s bankruptcy bring down Jaguar, such was his determination. He was confident that in 1981 and 1982 that he could have found the necessary funding to organise purchase of the company. A far cry from the days of Geoffrey Robinson. Among the “titans of the industry” Egan met was the boss of BMW with whom he discussed a possible tie-up. Little cameos of Jaguar dail life emerge throughout the text. As when journalists wondered why there were so few Cabriolets on the road. "David Boole, in one of his usual flashes of PR genius, blamed the roof configuaration. It was hand-nade, as we had not originally intended to make many, he told the Press. We would now put in proper manufacturing facilities, he said, because we were overwhelmed by demand - which was always a good excuse, even with tongue in cheek." To which Egan adds a few lines later: "We had a lot to learn. We were babies when it came to designing and developing new product. Stil.....after much effort and embarrassment our Cabriolet eventually became a success." Also, in 1983, "out of the blue" BL Cars received an offer from General Motors to buy Jaguar. Egan writes: "I knew from my previous life with GM that you had to go to the top if you wanted a vision that lasted longer than the 12-month budget". Egan concluded it was better to go independent and managed to convince Norman Lamont, Chief Secretary to the Treasury. The Cabinet agreed with Egan but with the proviso that a Golden Share should be put in place. Egan writes: "With that, he (Lamont) told me to deny any discussions had taken place, to put my hard hat on, and await events." And with that Jaguar was privatised, but not before the little matter of the Jaguar name was settled. Egan discovered the Jaguar name was owned by a company in Pakistan making tennis racquets. It also had a smart sports bag in British Racing Green with a leaping Jaguar logo imprinted in gold. "So we bought the company, and the sports bag eventually became the leading sports bag in the UK," writes Egan proudly. As is now well known, after some 10 years at the helm, Egan reluctantly began talks with Ford Motor Company after first discussing a possible deal with General Motors (GM). The GM deal would be difficult. “A Ford deal of some kind might be the only viable outcome, and might indeed be better than a risky project with GM, cobbled together in haste and with a degree of acrimony,” writes Egan. Egan could see Jaguar's tie-up with GM as being akin to an elephant getting into bed with a mouse. "It may not be very interesting for the elephant," writes Egan. "But the mouse usually gets killed." Detroit is a small place and Ford inevitably soon heard about GM's plans for a joint venture with Jaguar, even to the point of the two creating a joint XJ80 (partly designed by Jaguar's enginering director Jim Randle who also created the XJ220 supercar later made by TWR) to be made by GM and Jaguar. Unbeknown to Egan, Ford had been talking to Saab to sign a deal with the Swedish company. In 24 hours that would have happened if Egan had not made a Concorde trip to the US. In negotiations Egan secured a price from Ford of £1.6 billion for a company with a net worth of £300 million – the magic multiple of five used in business transactions. Almost immediately after completion of the transaction, Egan visited Ford’s World Headquarters in Detroit with a degree of trepidation. Called to the chairman’s office, 'Red' Poling asked: "Say, John. What am I going to tell the shareholders? I've paid five times the book value for a car company. I can't think of any car company worth even book value." Egan replied: "When I was taught to be a salesman, I was taught to sell the sizzle not the sausage. What you have bought here if $500 million of sausage, but you also bought $2 billion of sizzle. Think about it." Egan stayed at Jaguar for only a few months. Ford managers were concerned the company had bought a nameplate and some assets. And the first Ford people who came "did not like the assets". Writes Egan: "One of the early arrivals described some of the facilities as worse than at Gorky, a car plant he had seen in Russia." Since leaving Jaguar, Sir John Egan has been chief executive of British Airports Authority, president of the Confederation of British Industry and chairman of Severn Trent. He was knighted in 1986. 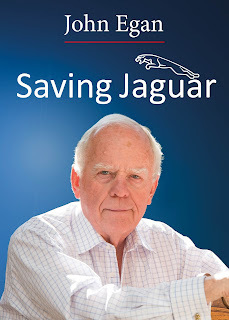 As to his years at Jaguar it does seem, from reading his book, that no matter what problem life threw at him, Egan had no difficulty in finding a solution. Egan now believes the future for Jaguar is "much brighter" under Tata Motors. Ratan Tata, when asked by an employee how long would Tata own Jaguar, he replied "Why, for ever." By John Mortimer, author of The ‘nearly’ engine – the story of the automotive gas turbine, and Angel in the house. ‘What if' is always an easy question to ask. But with the benefit of hindsight (always 20:20), one is tempted to speculate that John Egan's reign at Jaguar might well have achieved more positive results if he had enjoyed the key advantages of today's 21st Century Jaguar Land Rover company. I refer to the combination of virtually unlimited funding - from Tata - and the undoubted level of engineering and management expertise conferred by German (primarily BMW) executives at the top. Crucially, British trade unions (Egan's main 'enemies')seem more willing to co-operate with non-British management regimes - a legacy, I'd suggest, of lingering 19th Century class antagonism.